Yorkshire's fish and chips are famously good, so while on holiday there, I sampled them regularly! Not only is the meal associated with seaside holidays, there are also obvious advantages in eating fish landed a few steps from the chip shop. However, traditional as they now are, fish and chips were not an English invention. 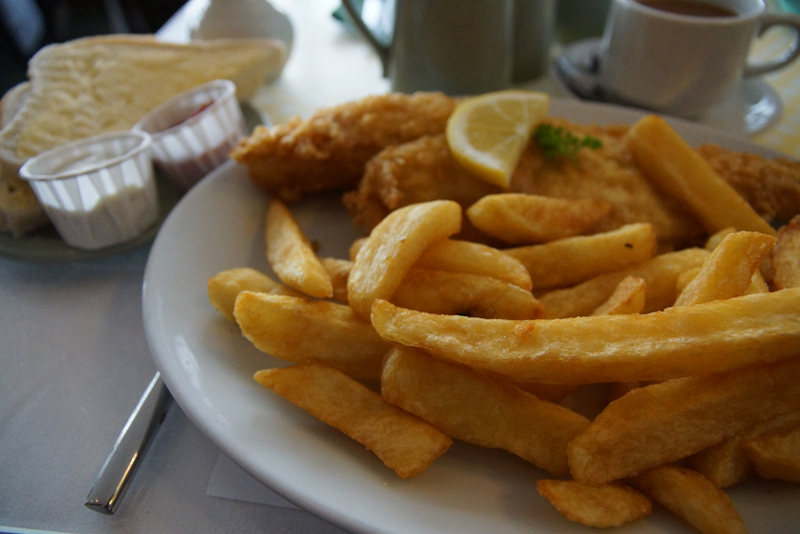 Fried fish arrived here separately from chips, although both seem to have reached us in the seventeenth century. The chips probably originated in France or Belgium, while fried fish was introduced from the Iberian peninsula by Sephardic Jewish refugees. The two came together in the 1860s, although who was responsible is a matter of fierce controversy. Northerners favour the claim of John Lees who sold fish and chips at Mossley market, Lancashire. London has its own claim, though, for a shop opened by Joseph Malin in East London. Even today there are regional variations: for example, Yorkshire's chippies fry in dripping while in London they generally use vegetable oil. However, there is no dispute that they are firmly established as one of our national dishes. Whitby perchance? Brings back great memories! Yes, Whitby and Scarborough. Thankfully, walking up and down the steep roads (and 199 steps to Whitby Abbey) meant I didn't come back a size larger! I remember being envious (in the 1950s) of Catholic families because they had fish and chips every Friday night for tea. Museums at Night is coming!